Sheesh!! Give a girl a break! Especially a girl who's daily delights include dancing around 5 boys and their dusty boots and Wranglers, bucket calves, wrestling gear, football pads, Legos, light sabers and toy tractors. I flashed George that one of a kind smile that said, "I may be your Mamma, but I'm also a girl, and this girl is gonna look at pretty things WHILE we watch gymnastics!" So, for this week...and maybe in future weeks, I'm sneakin' in a replacement for the usual "On The Farm Friday" posts. Today it's "Fabulously Feminine Friday" instead!! Yippee!! Your best cheerleader jump with a happy face is totally appropriate right now!! There's so many lovelies out there for a lady's heart to admire. These are just a few treasures that caught my eye and fit my style and personality. Most of them are from Etsy, because I love to give as many high-fives to the creative hard-working entrepreneur as possible! 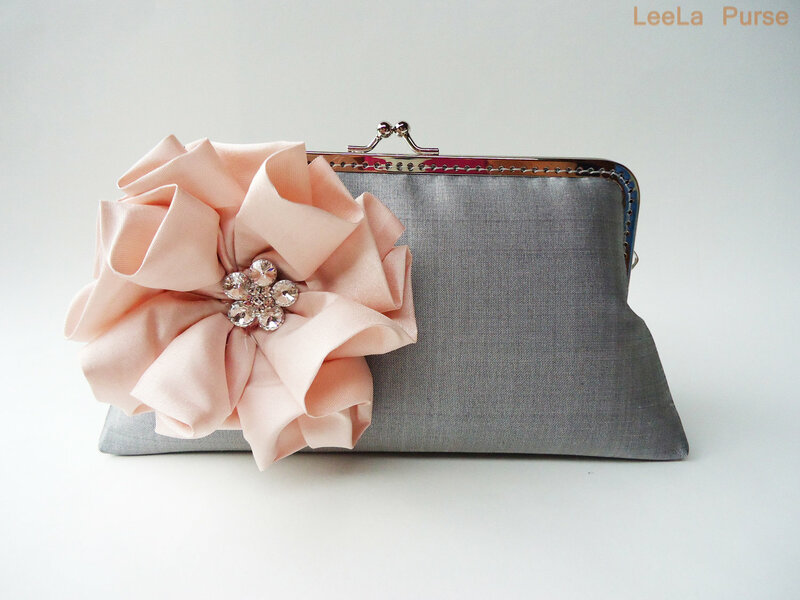 First up, this wonderfully lovely clutch from Leela Purse. I've always admired the radiance of a woman in a perfectly fitting shift dress, matching heels, a polished up-do and a clutch purse. Timeless chic. Clutches are perfect for date night and weddings or other special occasions. 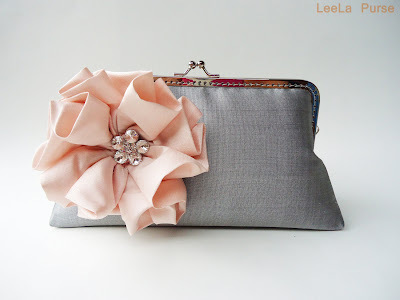 Speaking of weddings, this talented designer also makes clutches for bridal parties in every color imaginable. The lace detail on this line up is ultra feminine! What a perfect bridesmaid gift! I couldn't let my handbag quest end there (even though purses aren't tops on my shopping list). For practical purposes, the purse I carry right now is big. It must hold the usual stuff, plus a diaper, wipes, emergency blow-out outfit for Charlie, books for church, a sack of bribery candy, crayons, etc. 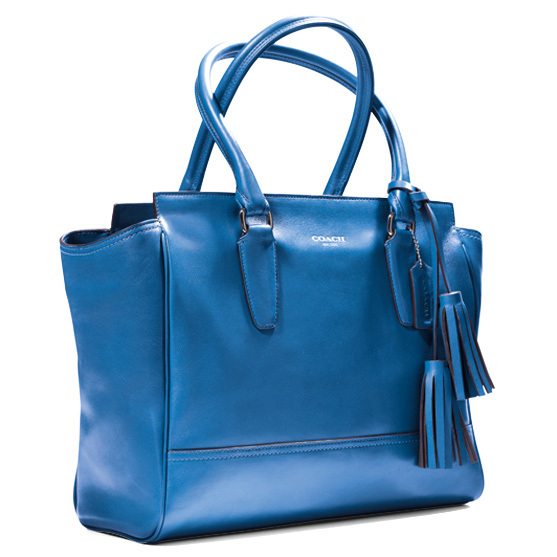 This blue beauty from Coach definitely fits the bill! Perfect shade and shape for fall. Not perfect for my budget, though, so I may have to cruise over to Ebay and see what bargains await me there! I am loving the trend of dressing up tees and tanks with feminine embellishments. This Raspberry Market Embellished tank in grey goes from being paired with a summer skirt right into fall. Layer under your favorite cardigan with jeans and boots. Dressed up or down it's perfect! This one is for all of my fellow Jane Austen fans out there. 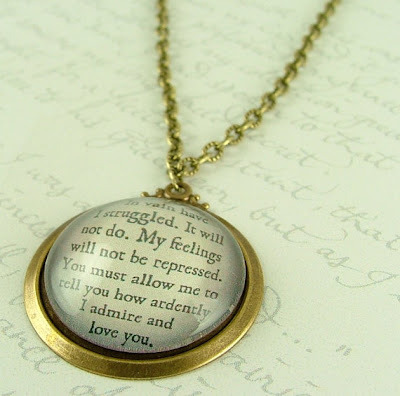 I absolutely LOVE this pendant which features the script from Mr. Darcy's famous proposal to his beloved Elizabeth. 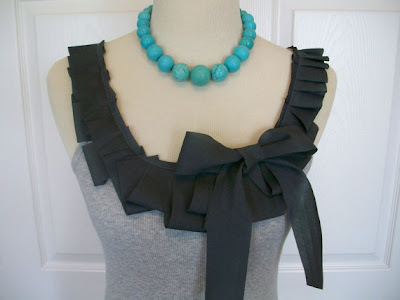 Layer with another necklace or wear alone over a lacy blouse and you have a winner! Over the past couple of years I have become a HUGE fan of aprons. They are so practical and help keep my clothes clean not only when I'm cooking, but crafting and doing chores around the house as well. 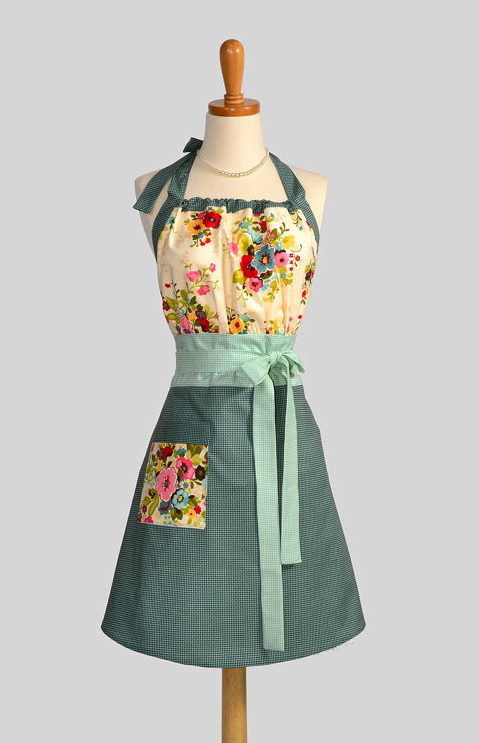 Get your June Cleaver on with these beautiful yet practical aprons from Creative Chic. Femininity + Athleticism = Sassy Skirts. Okay, so I don't actually own one of these sporty numbers, but I'm seriously thinking about buying one! Running Skirts has lots of fun options, plus skirts that come with tights for cooler temps. 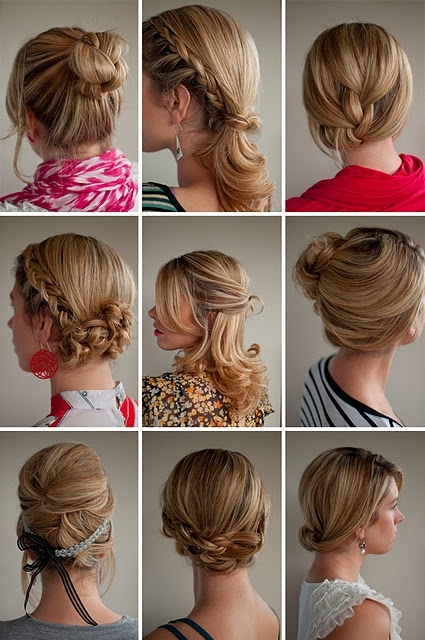 Being a serious fan of romantic style, I was excited when such lovely hair styling instructions began popping up on Pinterest. I downloaded the e-book of tutorials from Hair Romance, and have had so much fun trying them out on my nieces and on my own locks. Unlike banana clips and big, teased bangs, I hope these never go out of style! My list would not be complete without a special girlie beverage! 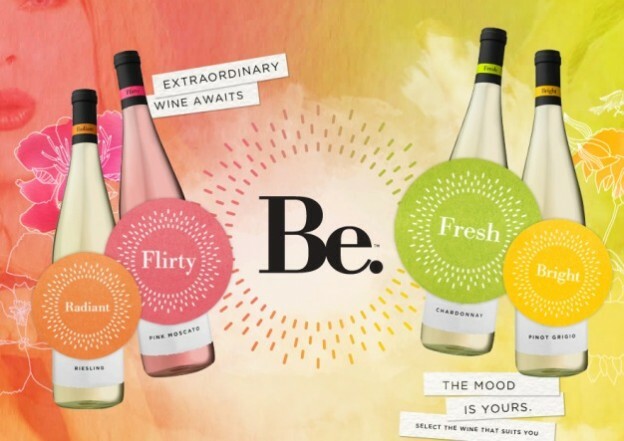 In lieu of the perfect cocktail recipe, I had to share this fun line of wines that I recently discovered from Be Wines. They are perfect for your next girly gathering! I hope to meet you back here on Monday with fresh new posts on every page! Have a fabulous weekend, my friends!! Love the Darcy pendant too!! And I have many running skirts . . . that is all I run in. Skirt Sports are my favorite for fit, but RunningSkirts has so many cute prints. Awesome, Katie! I'm going to give 'em a try. Thanks for the tip on Skirt Sports, I'll have to check it out! 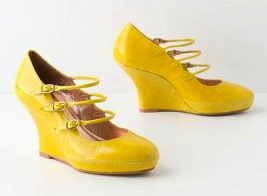 I'd kill a man for those mary jane yellow wedges! They are SO cute! I might have to head to ebay and look them up too. Isn't ebay one of the greatest things to happen to shoes and purses?